Planned, or not, there are some legitimate studies that are just destined to capture the media's interest. Curing cancer, or the common cold, of course. But creating or enhancing a flu virus to make it deadlier, or finding a plausible route by which a benign virus could mutate and kill us all, are also guaranteed headline generators. After all, the media loves stories where they can use the word `mutate' or `mutations' in it. And if it involves a virus like H5N1 or Ebola, so much the better. For the discerning reader, the operative word in the above headline is `May'. The study centers on Ebola Reston - notable for not being pathogenic in humans - and involves side by side comparison of its genetic structure to the four other highly pathogenic Ebola strains, looking for subtle differences that might account for its lack of pathogenicity in humans. `May' is used 18 times in the actual study (`likely to' appears 10 times), and while these slippery modifiers don't invalidate the study's findings, they do remind us there are still an awful lot of unknowns here. Researchers found relatively few differences between Reston and the deadlier strains, and by focusing on key areas of the virus they believe affects the virulence of the virus in a human host, the authors have concluded that only a few changes in one Ebola virus protein (VP24) may be needed to turn Ebola Reston into a virus that can cause human disease. A decade ago we were warned that H5N1 was (take your pick) 5, 3, or as little as 1 mutation away from becoming a pandemic strain, and that hasn't happened yet. So these sorts of assessments - while of genuine scientific interest - aren't necessarily predictive of future events. The study itself may be read in its entirety at the link below. When you return, I'll have a bit more on the history, and mystery, of Ebola Reston. 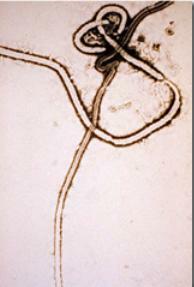 Reston viruses are the only Ebolaviruses that are not pathogenic in humans. We analyzed 196 Ebolavirus genomes and identified specificity determining positions (SDPs) in all nine Ebolavirus proteins that distinguish Reston viruses from the four human pathogenic Ebolaviruses. A subset of these SDPs will explain the differences in human pathogenicity between Reston and the other four ebolavirus species. Structural analysis was performed to identify those SDPs that are likely to have a functional effect. This analysis revealed novel functional insights in particular for Ebolavirus proteins VP40 and VP24. The VP40 SDP P85T interferes with VP40 function by altering octamer formation. The VP40 SDP Q245P affects the structure and hydrophobic core of the protein and consequently protein function. Three VP24 SDPs (T131S, M136L, Q139R) are likely to impair VP24 binding to human karyopherin alpha5 (KPNA5) and therefore inhibition of interferon signaling. Since VP24 is critical for Ebolavirus adaptation to novel hosts, and only a few SDPs distinguish Reston virus VP24 from VP24 of other Ebolaviruses, human pathogenic Reston viruses may emerge. This is of concern since Reston viruses circulate in domestic pigs and can infect humans, possibly via airborne transmission. As to whether Ebola Reston could someday mutate into a more dangerous form, the answer is that it probably can. Viruses mutate, and given enough time and enough rolls of the genetic dice, increased virulence is always possible. As to how likely that is to happen, or when, the truth is scientists haven't had a lot of success in predicting if or when a virus is about to break bad. Maybe, though . . . with enough research . . .